Local homebrewer Bryce Healy adds hops to his brew in South Burlington. 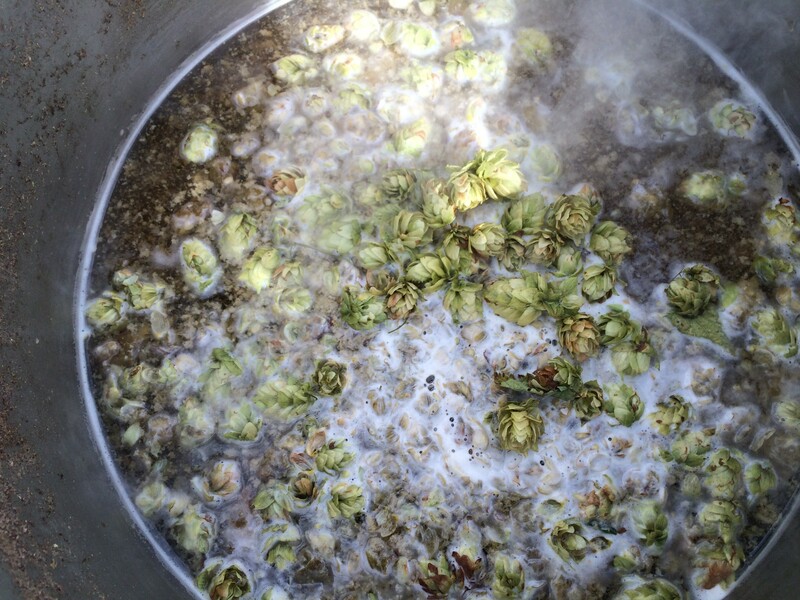 Homebrewing, like any act of creation, involves inspiration and often passion. It's dirty, stinky, pricey and labor intensive, and there are never any guarantees that the beer will be good. But the fruit of a homebrewer's effort — whether good, bad, plain or interesting — is a reflection of that brewer's skill, as well as of their thoughts and ideas, hopes and dreams, and the moment when they made and nurtured the brew. Most homebrewers work by day and brew on nights and weekends, but many dream of supplanting their nine-to-five gig with a job brewing professionally. Now, 14th Star Brewing, Winooski Beverage Warehouse and Farrell Distributing have teamed up with some of Vermont's finest restaurants and tap rooms to launch a statewide brewing competition, called "Make the Cut," which will allow one winning homebrewer to sell his or her beer statewide. The idea originated with Winooski Beverage owner Jennifer Swiatek, who says she spends hours with local homebrewers every week as they line up at her shop waiting for Heady Topper and other hard-to-find brews. "You see these people in line for hours, saying, 'One day, maybe I'll get to do this for a living.' I wanted to give them that chance," she says. Swiatek says she's been toying with the idea for years and thought it would be fun to apply the reality-TV cooking-competition model to brewing. "That's a long way down the road," she says, but running a local homebrew competition seemed more immediately doable. Getting partners on board was a snap. "Everyone I talked to was, like, 'Wow what a great idea,'" she says. "We [all] want to nurture as much of Vermont's homegrown desire to be the best as possible. It is so good for our state." Homebrewers must enter by March 31, and after two rounds of judging, a winner will be announced the week of the Vermont Brewers Festival, in July. One hundred percent of the proceeds from each brewer's $10 entry fee will be split between Purple Hearts Reunited and a charity of the winner's choice. Judges have yet to be named, but will include professional beer critics, Vermont brewers and beer buyers, as well as members of the media and beer blogosphere. After a first round of judging, two semi-finalists will brew batches of beer at 14th Star's new brewery in St. Albans. Those two beers will be sold in tasting pairs at beer-destination restaurants, among them Waterbury's Prohibition Pig, Burlington's Farmhouse Tap & Grill, Woodstock's Worthy Kitchen and Winooski's Mule Bar. Customers will vote on their favorite of the two, and poll results will play a role in the final decision. The winner will get to pour his or her beer at the 14th Star tent at the brewfest, and will have it on draft at local restaurants and sold in cans statewide. The winner will also be featured — along with other competitors — in a mini-documentary about the competition and Vermont's homebrew scene. 14th Star owner Steve Gagner (a longtime homebrewer) says he's excited to give someone a chance to share their beer with a wider audience. “It’s kind of like when you give your kids presents on Christmas. I’m really excited to see that person’s expression when we give them a chance to put their beer in front of a couple hundred thousand people,” he says. As a homebrewer turned successful pro, what advice can Gagner offer entrants? "Just go for it." Because, Gagner notes, opening 14th Star was not a rational move. "But we were too dumb to know any better — or too dumb to care," he says, "so we just went for it." The competition, he says, will offer the winner a chance to get real-world feedback and sales figures and exposure in the industry. It takes away the fear of failure by giving the brewers access to "some of those resources that we spent a few years and a couple million dollars creating."